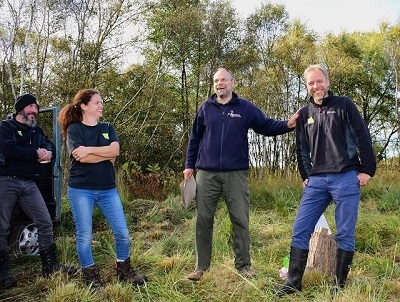 We are sad to announce that after 10 years as Natural England’s Senior Reserve Manager for Somerset National Nature Reserves, Simon Clarke is moving on. However, he is staying with Natural England and is starting an exciting new role looking at the future for National Nature Reserves in Somerset, Avon and Wiltshire. During his time based at the Avalon Marshes Centre, Simon has contributed a huge amount to the reserves, through his work creating the Sweet Track Footpath, building our essential volunteer groups and crowd-funding the new Tower Hide. Simon’s hard work has helped to drive the Avalon Marshes Landscape Partnership, including the mire restorations at the Ashcott Plot and Canada Farm Lows, and securing funding for the much needed office development. Most of all he has engaged with many different groups who use and love the reserves; listening and always trying to do what is best for the bigger picture of nature reserves across Somerset. He will be sorely missed!